A lot of people skip Norway because of how expensive it is. It’s true that Norway is not a budget destination. Even the most frugal person will have a hard time saving money here, which is why most travelers wait until they are older to be able to afford it. However, Norway is so amazingly beautiful that I think you should find ways to work it into your trip. The Norwegians are wonderful people; everyone speaks fluent English, and the sheer beauty of this country is too compelling to ignore. There is nothing like sailing around the fjords in the north. You could make it a stopover on a large trip to Sweden or Northern Europe. I have cousins in Oslo so I go back frequently and am always pleasantly surprised by the natural beauty of the country and hospitality of the locals. Use this guide to find the ninja ways to save money on your next visit! There is much beauty to behold in these narrow, deep sea inlets. 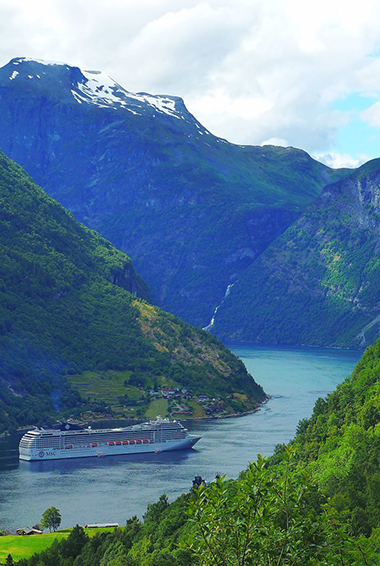 Surrounded by high cliffs, the fjords of Norway are world renowned and are sure to exceed your expectations. Consider Geirangerfjord and Nærøyfjord. They are visited by roughly one million people every year. The capital of Norway is a beautiful city located on a fjord. Browse art at the National Gallery, check out the Viking Ship Museum, or spend an afternoon strolling the shops and cafes Aker Brygge wharf. Don’t miss Vigeland Sculpture Park, with more than 200 of Gustav Vigeland’s unique sculptures. 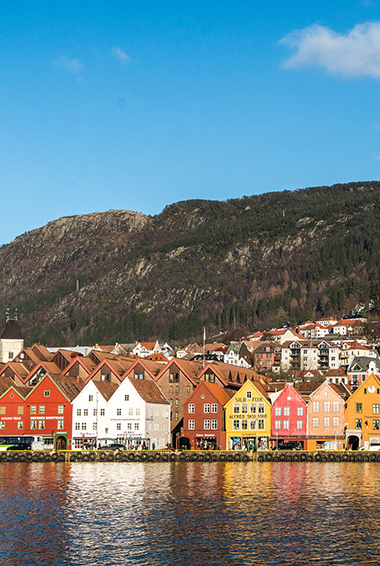 Lift off from Bergen’s city center and travel up Floyen mountain for amazing views of Norway’s second largest city. You are sure to enjoy the panoramic view and various hiking routes. For something cultural, visit Gallery Nygaten 7 — considered the most stunning gallery in the country. 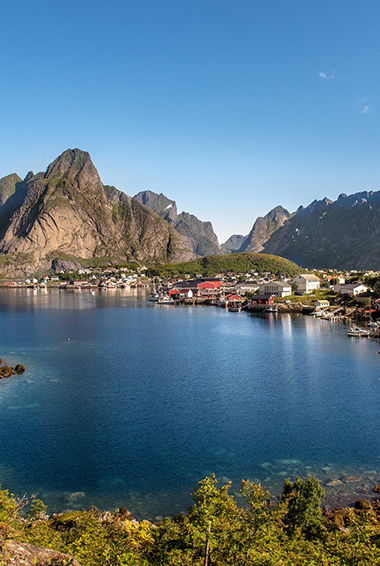 Located far in the north, Lofoten is a picturesque area well worth the effort (and cost) to get there. Its mountains, fjords, wildlife, and traditional lifestyle are all what makes this place so great. There’s excellent fishing in Lofoten, as well as plenty of opportunity to see the northern lights. 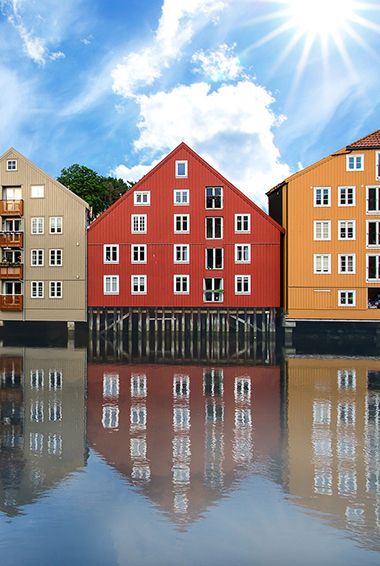 Colorful, laidback, and filled with students, Trondheim is a fun place to party and meet new people. Bustling with various restaurants, bars, pubs and clubs, you are bound to have a great time, especially those of you studying abroad! Preikestolen (Preacher’s Pulpit or Preacher’s Chair) is one of the most famous landmarks in Norway. An unusually flat and wide surface located atop a cliff, Preikestolen is only reachable by hiking a 4km trail. With around 200,000 visitors per year, you’ll want to make sure you arrive early in order to take some photos without all the crowds. For the nature-loving traveler, Norway is host to some of the most spectacular natural beauty in the world. You will see everything from waterfalls and glaciers to reindeer, lynx, and wolves. You can also enjoy all sorts of outdoor activities, from caving and canyoning to rafting. Consider Jostedalsbreen National Park, host to the largest glacier in continental Europe. The northernmost tip of Europe, Norway’s North Cape is great for hiking, trekking, driving tours and more. Explore the jagged coastline and Finnmark, which includes six national parks. There is nothing quite like a day outdoors, in a foreign land. Perfect for a 24-hour party, Tromsø in the summer is a city that doesn’t sleep. Experience unbroken sunlight amidst the many pubs or if you happen to visit in the winter, catch the Northern Lights. Tromsø is one of the best places in the world for both. Norway is one of the top ski destinations in the world, so if you’re into it, hit the slopes! Choose from any number of resorts, for snowboarding, telemark skiing, cross country skiing, or snowboarding. You won’t get many opportunities like this elsewhere! Lift tickets range from 350-450 NOK per adult, for weekdays. Expect to pay more on the weekends. Open daily, this market offers more than just fish — a must see for everyone. Explore the many stalls, snap some pictures, and check out the waterfront. Just a short walking distance from many museums and galleries. If you are in Oslo, you should definitely check this out! One of Norway’s most popular visitor destinations, this unique park is host to the world’s largest collection of sculptures executed by a single artist. Don’t miss this! One of the oldest parts of Stavanger, this area is composed of small, rock streets, lined with old white wooden homes built during the 18th century. Taking a walk down here is like going back in time. Be sure to take in the history and check out the various paintings, pottery, and more offered by local artists within the area. Built during the first half of the 19th century, the Royal palace is an interesting place to visit. Beyond the architecture, and historical significance, many come to see the changing of the guards. If you make it to Oslo, it is a neat stop to make during your afternoon adventure. The palace is open during the summer for guided tours, which cost 135 NOK for adults (105 NOK for students/seniors/children). Located in Trondheim, this a nice switch from your typical museum trip. Check out the awesome collection of musical instruments, walk around the park amidst the farm buildings, and enjoy lunch at the tea house. This is one of the most underrated stops in Norway. Adult admission is 110 NOK. Children under 15 enter free. There are many museums throughout Oslo showcasing Norwegian history and Viking tales, but this is perhaps the most interesting. Cross the Fjord to Bygdoy and immerse yourself in the history. The biggest attraction is the Gol Stave Church, dating back to 1200 AD, however, there are many other attractions to see. It’s open air, so get ready to roam! Adult admission is 125 NOK (90 NOK for students and 40 NOK for children). If you are a jazz fan, you will definitely want to catch this! Held every May, this festival is a weekend-long, fully-packed event, featuring several of the most well-known jazz artists in the world. The weather might be balmy, so make sure you grab your coat. Accommodation – Like everything else in Norway, accommodation isn’t cheap. Hostel dorm rooms cost between 200-500 NOK per night while private rooms are around 750 NOK for a single. A few hostels will offer free breakfast, so keep your eyes peeled. You can book your hostel with Hostelworld. Hotels begin at around 1,000 NOK per night for a double room, though don’ expect anything too fancy! Use Booking.com as they consistently return the cheapest rates. Airbnb is common in most major cities, with shared accommodation costing around 400 NOK for a night. If you want a private apartment or home, however, you’ll pay closer to 950 NOK per night. You can also camp on public lands for free if you have a tent — just use common sense and be respectful of the land. There are also numerous campgrounds around the country, as the Norwegians are an outdoorsy people. If you plan on doing a lot of camping be sure to get a Camping Key Europe card. It grants you access to over 250 campgrounds in Norway and costs only 130 NOK. The card include discounts for campgrounds all year (and all around Europe) and also offers easy check-in and even some travel insurance! Food – Eating out is expensive, with fast food starting from 90 NOK and sit-down meals in a decent restaurant nearly always topping 285 NOK or more per main course. McDonald’s and Burger King value meals are around 125 NOK. For a cheap quick snack Norwegian-style, look no further than the nearest grill or convenience store, where you can eat a hot dog or sausage for around 30-50 NOK. If you are going buy your own food, expect to spend about 570 NOK per week. To keep costs down, avoid fresh vegetables and chicken fillets. Meat is a cultural staple here, so vegetarians beware — Norway can be a tricky place to grab a vegetarian meal on a budget. Transportation – Trains around Norway cost between 300-610 NOK between cities, depending on the distance and the time you buy them. If you book trains early enough, they will be on the cheap side. An extensive range of express buses connect cities all over Norway and even most national parks. If you’re lucky, you can get a ticket for as little as 80 NOK, but usually, the tickets go from 290-700 NOK, although they can cost over 815 NOK. The double decker buses are clean and modern with free WiFi, coffee, and tea. Buses and trains also connect to Sweden, which can then easily connect you to mainland Europe. 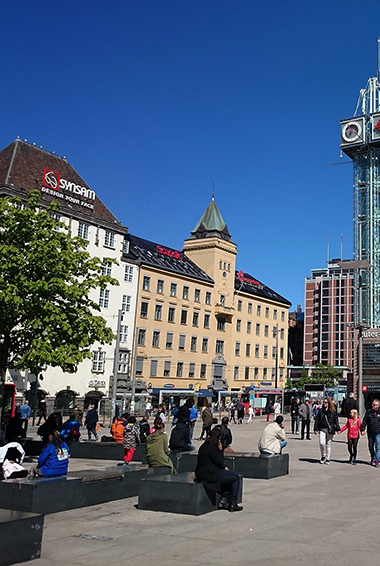 Norwegian Air offers great budget flights to many airports around the world, making Oslo a good destination to start or end your trip to Europe. Activities – Norway is the land of fjords and seeing them is the most popular activity here. Most multi-day tours cost 1,050 NOK per day. You can find day tours to the fjords for around 400-650 NOK. Camping is free in Norway so as long as it is public land you can camp anywhere. Museums are usually 80 NOK. With so much pristine nature, you’ll want to take advantage of it as much as you can. Skiing, kayaking, and hiking are all great ways to get out and enjoy the scenery without breaking the budget. Cook your own food – Food is very, very expensive in Norway so the best thing you can do is it simply make your own meals. Go grocery shopping but skip buying lots of fresh vegetables or whole chicken fillets as they are very expensive. Minced chicken is cheaper. Avoid eating out!!! Eat cheap – If you do decide to eat out, your cheapest options will be shwarma and pizza. These meals usually cost around 80 NOK and can be found all around the country. Couchsurf – The best way to avoid expensive hostels is to not stay there. Couchsurf or use Airbnb to rent a room or apartment so you can save your money for what is really important — sightseeing and beer! Camp – Free public camping laws allow you to camp in the parks and public lands for free as long as you have your own tent. You can generally stay 1-2 nights in an area as long as you are quiet and respectful. Make sure to leave the area as you found it! If you plan on camping a lot, make sure to get the Camping Key Europe card. It’s 130 NOK and offers discounts to most of Norway’s campgrounds. Book in advance – If you can plan your transportation in advance, you can save up to 50% off the cost of your train or bus tickets. Buying last minute means it’s going to be more than any budget traveler can afford, especially if you want to visit a number of destinations in Norway. Book in advance and save yourself some money! Stay sober – At 60 NOK per drink (though often more! ), going out will destroy your budget. While the Norwegians love to go out and have a good time, if you are on a tight budget, skip the drinks! Better to save your money for sailing around the fjords.